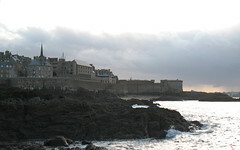 The walled city of Saint-Malo, in the French region of Bretagne, was once home to privateers, pirates, and the French writer Chateaubriand. The hotel in which we stayed was once the mansion where he was born. 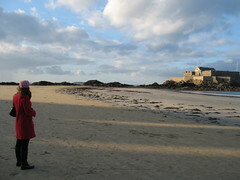 Today, Saint-Malo is a great place to walk along the beach or watch the ocean atop the ramparts that surround the inner city. After that you can pop into a café for moules frites or a galette, a type of savory crèpe made from buckwheat flour. It’s also a great place to get a plateau de fruits de mer. To give you a sense of this dish, imagine taking a boat into the ocean nearby, letting out a net, and pulling up whatever living thing you found, then placing that onto a multi-tiered platter. What you get a huge pile of oysters, langoustines, pink shrimp, grey shrimp, multiple types of sea snails, clams, some lemon and mustard sauce on the side, set into piles of kelp and topped with a whole crab. We managed to finish most of it, although I don’t think I would consider sea snails “every day” fare. 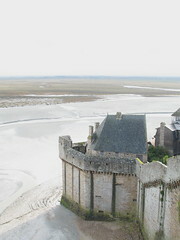 The next day we took a bus Le Mont-Saint-Michel. 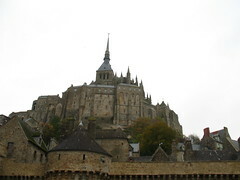 Le Mont-Saint-Michel is one of those iconic images of Northern France, and perhaps of France in general — a spire of stone jutting out from the sandy beaches of the Bay Saint-Michel. I would have loved to walk out on to the beaches, but the sand had the consistency of wet cement and it didn’t seem that safe to take a leisurely stroll. Perhaps it’s safer in other parts of the year; however, considering the number of people who were filling the small winding streets and ramparts, had we gone in a less wet part of the year, we might not have been able to walk anywhere. 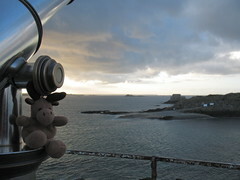 After spending a few hours there, it was back on the bus to St. Malo. No strange platters of sea creatures for dinner this night. The next morning, we’d go to a café for a petit déjeuner, a short walk around the city and the beach, then hop back on the TGV headed for Paris. Un grand Écrivain français a voulu reposer ici, pour n’entendre que la mer et le vent. Passant, respecte sa dernière volonté. This is the tomb of Chateaubriand. Loosely translated, it says, “A great French writer wanted to rest here, to hear only the sea and the wind. Passerby, respect his final wish.” Letting the brisk wind blow through your hair and listening to the waves, it’s not difficult to be stunned into silence here. This entry was posted on Thursday, November 20th, 2008 at 7:47 am and is filed under Travel. You can follow any responses to this entry through the RSS 2.0 feed. Both comments and pings are currently closed.